uuid : ed9258e7-6f35-4c34-9ca0-4b9ddc153f4d templates_id: 119585 templates_uuid: "19b06a50-ec0b-4f59-8630-0512c3ce3e1f" title: "Statutory Declaration Name Change - Statutory Declaration Change of Name" display_name: "Statutory declaration of name change " meta_keywords: "Name change by statutory declaration" description: "
Make sure you follow proper legal procedure when you want to officially change your given name, surname or both with this statutory declaration of name change. This statutory declaration of name change will provide written evidence to the passport office, banks and other organisations that you have changed your name and that you now only want to be known by your new name. Once you have completed and printed your statutory declaration of name change you will have to have it sworn by a solicitor for it be valid. What is a statutory declaration of name change? A statutory declaration of change of name is a document which can be used if you would like official organisations (eg. your bank, building society, the passport office etc) to recognise your new name. It can be used if you want to change any part of your name (first name, surname, middle names etc). It provides written evidence that you have decided to change your name and would like your records changed to reflect your new choice of name. Why do I need a statutory declaration of name? Although anyone can change their name at any time, in order to use a new name on official documents or have the change recognised by government organisations, banks and even utility companies, you will usually be required to provide evidence of your change of name. Using a statutory declaration of name change is similar to getting your name changed by deed poll. However, unlike with a deed poll, you cannot have a statutory declaration officially registered. Aside from statutory declaration of name change and deed poll, the other way of changing your name is through marriage, civil partnership, divorce or dissolution of civil partnership. How do you complete a statutory declaration of name change? As with a deed poll, in order to make a statutory declaration of a change of name, you must be aged 18 or over. Ask a lawyer for advice if you would like to change the name of your children (eg. in the case of divorce and remarriage). A statutory declaration of name change should include your old name, the new name you wish to be known by, your clear intention to change your name accordingly, and your current address. You will then need to sign it (using your new name) in the presence of solicitor or a magistrate (Justice of the Peace). The solicitor or magistrate must also include their details and sign the document to make it valid. Who should you inform about a change of name? You may also need to change your name with any online shopping or entertainment companies which hold your payment details (eg. Amazon or Netflix) - and your local gym or companies with which you have direct debit arrangements. This is because a different name to the one held by your bank or credit card provider can cause payment issues. changing your name by deed poll. You will need to go down this route to have your change of name officially registered. However, this is not a legal requirement in England and Wales and a statutory declaration is accepted for most purposes as evidence of a change of name. 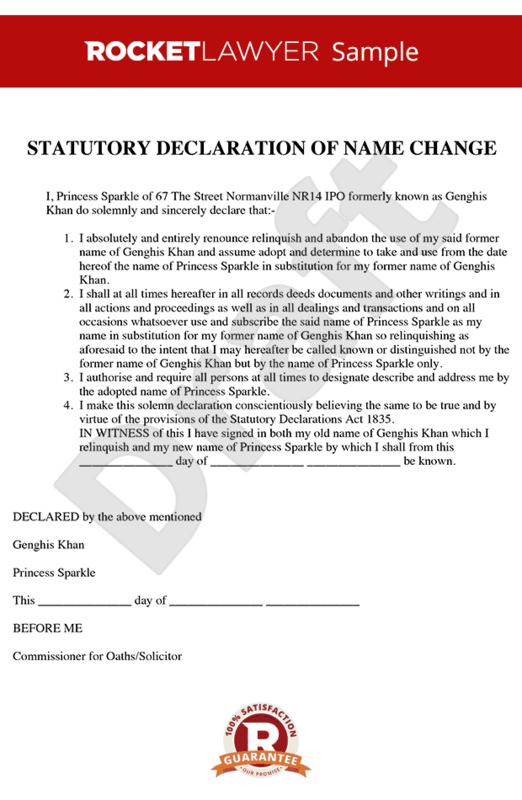 This statutory declaration of name change is governed by the law of England and Wales. \r\n\r\n" created_timestamp: "2018-10-08 04:37:09.0" modified_timestamp: "2018-10-08 04:37:09.0" active: true created_by: 104 modified_by: 104 dcm_id: 285 url_slug: "Statutory-declaration-of-name-change" meta_description: "Let Rocket Lawyer help you complete a statutory declaration name change when you change your given name, surname or both. Provide written evidence that you\'ve changed your name and want to be known by your new name with our statutory declaration of name change. " time_to_complete: "10 minutes"
More than just a Statutory declaration of name change template, our step-by-step interview and guidance makes it easy to create your document. Easily create online, download, print and sign your free Statutory declaration of name change in minutes. This document is also sometimes called: Name change by statutory declaration.